When the Swiss attempted to create a cavalry carbine for their 7.5 round, they made several attempts to shorten the 1889 Schmidt-Rubin. The most interesting attempt include a folding wooden stock , which feature a large hinge in the buttstock. However, due to the length and weakness of the 89 action, none of these attempts were successful. As a result, in 1893 the Swiss government began trials to select a new carbine. Several designs were submitted. SIG submitted two turn-bolt designs, both turn-bolt and straight-pull Mannlichers were submitted, as well as a modified Mauser design and a straight-pull design by Vogelsang and Krauser. In the end, the compactness of the straight-pull Mannlicher, won the day. The 1893's bolt and receiver are almost identical to those of the Austrian M1895. For bolt disassembly and re-assembly instructions click here. 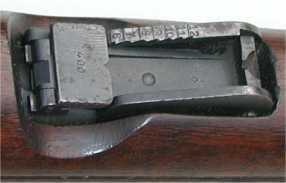 However, unlike the M1895, the Swiss 1893 uses a detachable box magazine, fed by the standard Swiss stripper clips. It should be noted that the 1893's where never chambered to fire the modern GP11 7.5x55 ammunition, and should never be fired using modern loads. 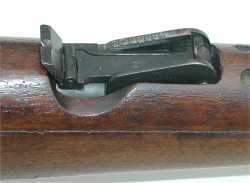 Other features of the 1893s included a full length stock and handguard, protected front sight, and a German-style sling-anchor in the buttstock. The Swiss were not particularly pleased with the 1893. Chief amongst their complaints were the difficulty in stripping and reassembly of the bolt and poor accuracy. 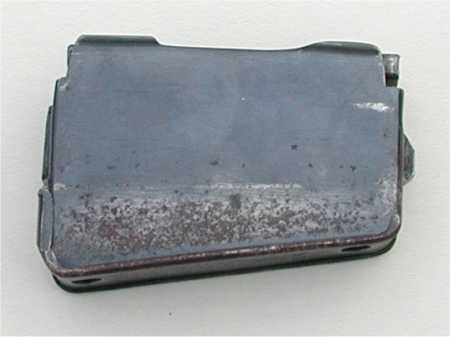 Even trained troops had a hard time reassembling the 1893 bolt, and more than a few bolts were damaged in the process. The 1893 Carbine remained in production, until 1905, when it was replaced by the Schmidt-Rubin Model 1905 Short Rifle. Today, Model 1893 Carbines are rare. Many were destroyed during drills, where Swiss soldiers smashed the buttstocks of the 1893 against the ground as hard as they could. This, combined with the small number produced (7750), results in price tags that usually range in the $700-900 range, depending on condition and matching parts numbers.